This issue of Healthy Fruit kind of ends the pest management season and begins the harvest season. (Although I noted an apple maggot fly adult on Ginger Gold apples yesterday while collecting a sample to assess maturity.) 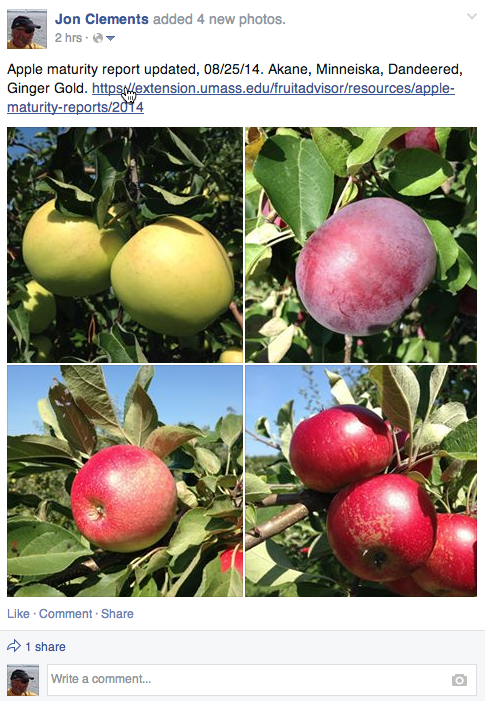 Note the apple maturity report below and always available on the UMass Fruit Advisor. Moldy core results when fungi invade an open calyx. 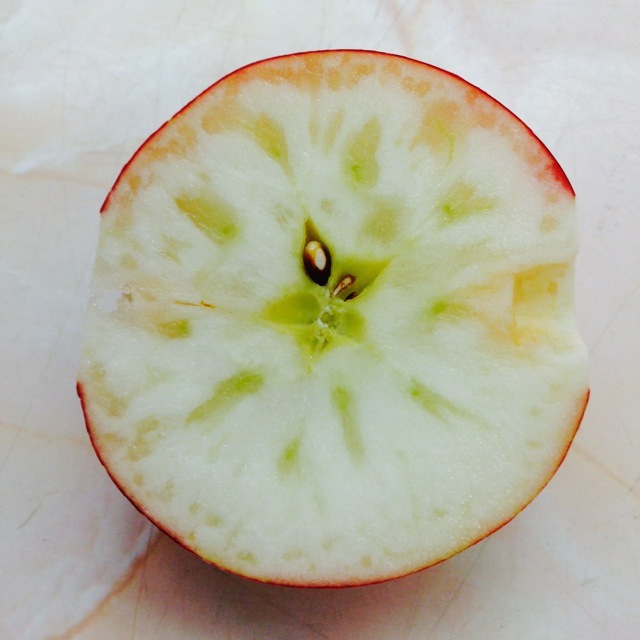 Moldy core can initiate at petal fall, so fungicide sprays are recommended then for apple varieties that typically exhibit moldy core symptoms, such as Ginger Gold, Cameo, Golden Delicious, and Idared. Moldy core can be more prevalent with light fruit set, and when it is dry early summer followed by rains late summer, or when it is wet during bloom and petal fall. (Describes this year pretty good.) Good, sound fruit should not be adversely affected by moldy core. For more information on moldy core see: http://extension.psu.edu/plants/tree-fruit/diseases/apple-diseases/moldy-core-of-apple. See Upcoming Pest Events and AgRadar for current pest status. With harvest just beginning and already underway on some farms, it is a good time to review the indicators of optimum harvest as well as dealing with Honeycrisp. Indicators for optimum harvest time vary by variety, seasonal weather, and position within the tree canopy. Optimum harvest also varies by whether the fruit is going into CA storage – long or short, cold storage or picked for immediate sale (PYO, farm market, etc). There are several tools available to help determine maturity – all of which can be done in the field. Choose fruit from the same area within the tree canopy each week you test because fruit on the inside of the canopy will test differently than those on the outside. Fruit exposed to sun matures at a different rate than fruit in the shade, and so on. Fruit firmness is a good indicator for CA storage cut-off but is rarely used alone. 15#-16# or firmer with high sugar content is good for CA storage (this varies by variety). Softer fruit will probably not hold up well in long-term storage. Softer readings are good for PYO and fall sales. Large fruit are going to be soft, generally, before small fruit, and those on the inside of the tree will be softer than those on the outside of the canopy. Choose fruit size that is representable of your crop. Testing small, medium and large fruit is fine as long as you differentiate them in your records and don’t compare one size to another when making harvesting decisions. Use the larger head on the firmness tester for apples and the smaller head for pears. Test both the green side and the blush side of each fruit, and then take the average. Remove only the skin – do not cut into the fruit deeply or your test will be flawed. This works best when done on a hard surface and not when holding the fruit in your hand. All of these tests can be done in the field simply, quickly and accurately. Begin testing a couple of weeks before the anticipated beginning of harvest. Keep records and test weekly, more often during harvest to avoid placing fruit into CA – short or long term – that shouldn’t be there. Soft, over-mature in = poor fruit quality coming out. Such a fickle variety to grow and store, makes one wonder why anyone would bother, except that customers want it. Harvesting and storage is important with all varieties but Honeycrisp is abit different because it is susceptible to a wider range of physiological disorders including senescent breakdown, greasiness, bitter pit (hopefully you applied calcium in your cover sprays this summer), soft scald, soggy breakdown and wrinkling. Make sure the fruit has enough red color at harvest. The background color should be breaking from green to yellow. Acid level should be fairly high, preferably at least 0.5 percent. Honeycrisp at 12.5 pounds pressure will retain firmness and texture if handled properly in storage. There is a difference in how the apples perform in storage, depending on if they’ve been treated with MCP before harvest (Harvista) or after harvest (SmartFresh). Because Harvista tends to delay maturity, it can reduce sensitivity to chilling injury, which has not been seen from a SmartFresh application. Smart Fresh treatment of air-stored fruit can be as effective as CA storage for at least several months. It is very important to condition the fruit for 7 days at 50°F before putting into storage at 37° to 39°F to avoid chilling injury and reduce the risk of soft scald. However, low temperatures in the orchard before harvest can also induce these disorders. If the chilling has happened in the field, there is nothing that can be done postharvest to prevent the disorders. Oxygen level should be 2 to 3 percent. Low oxygen is not necessary because the variety retains its firmness well, and there can be fruit injury from very low levels. The next Healthy Fruit (and apple maturity report) will be published on Tuesday, September 9, or thereabouts, 2014. (In two weeks.) As always feel free to get in touch with any member of the UMass Fruit Team (http://extension.umass.edu/fruitadvisor/team-members) if you have questions or comments.